At eachanoriginal we DESIGN fridge magnets, HANDPAINT our fridge magnets, INSPIRE with fridge magnets . . . we simply LOVE our magnets and we know you will too! Created and assembled by hand in the beautiful Okanagan Valley in British Coumbia, Canada; each and every magnet is an original work of true fridge ART. Our handpainted tile fridge magnets are sold individually in the form of letters, images and inspirational words. We also combine these into various sets packaged in a subtle clear sleeve. Giftworks Boutique currently carries the zen fridge magnets. If you require any of the other product lines (brights or black and white), we can order them for you. 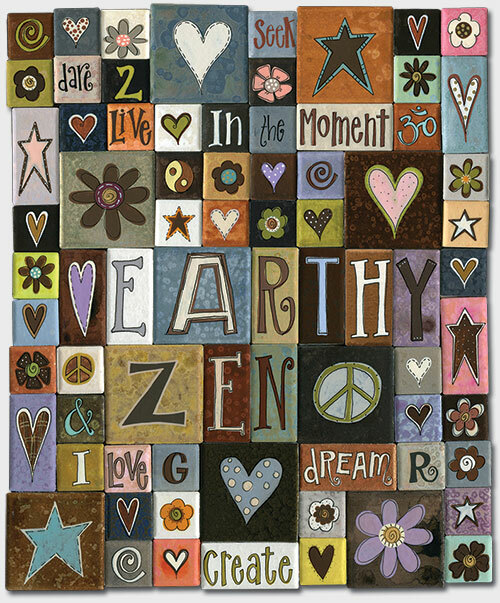 Our zen fridge magnets are hand-painted in serene earth tones with luscious hints of colour inspired by nature. The magnets come in three sizes and a versatile range of designs,as illustrated by just a sampling on this page.